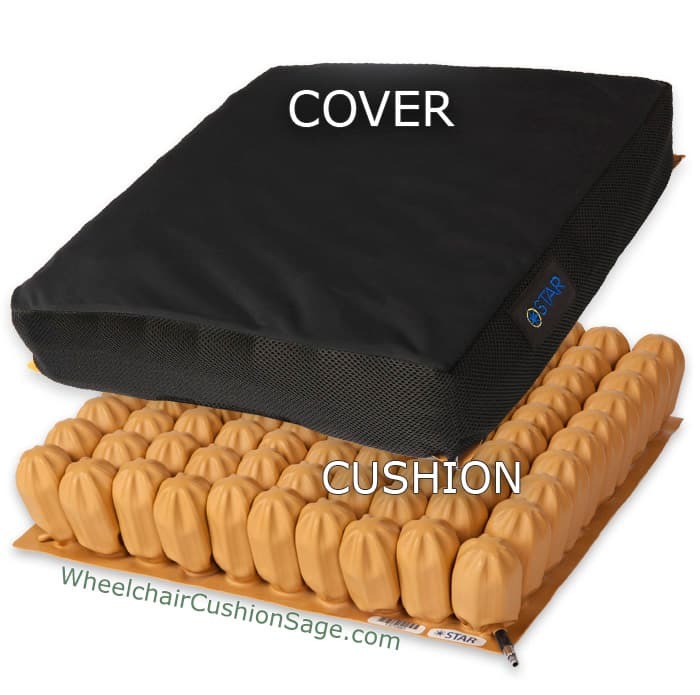 The Star Stabil-Air wheelchair cushion can generally be categorized as an air cushion due to its weight bearing air-filled cells. Star Cushion - the manufacturer of this product - specifies this cushion as follows. The Stabil-Air name (sometimes erroneously referred to as Stable-Air) is derived from the cushion's foam-in-air structure which produces a less wobbly (i.e., more stable) seating solution than more traditional valved, air-only cushion structures. Unlike the common matrix of equi-pressure air cells, Star's Stabil-Air structure includes a foam pillar inside every air cell. Each foam pillar is shorter in height than the air cell that contains it. The foam pillar geometry varies across the topography of the cushion — the associated variance produces; for example, left and right cushion edges that are more firm than the central portion of the cushion. Four air cell heights (i.e., cushion thicknesses) are available. The cushion options include models with 1, 2, and 4 air valves. The air valves are twist-to-open, twist-to-close valves rather than Schrader valves. Models with multiple air valves — 2 valves and 4 valves — enable different portions of the cushion to be inflated to different pressures. Two valves permit different pressures in each half (the left and right halves or the front and back halves) of the cushion. Four valves permit different pressures in each quadrant of the cushion. The single  valve model permits setting; with one valve, the same pressure throughout the entire cushion. The manufacturer lists the following sizing recommendations. 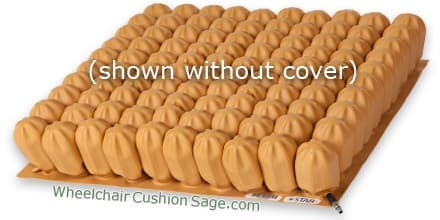 The extra cover option refers to purchasing a Star Stabil-Air cushion and the extra cover at the same time (not separately). The cover can be washed in a typical washing machine, but the manufacturer recommends avoiding the use of a washing machine when washing the cushion. The cushion itself can be submerged in a tub or bucket, or otherwise hand-washed using common cleaning agents suitable for clothing. Be sure to close the air valve(s) when washing a Stabil-Air cushion so that the internal foam pillars do not get wet.